Happy Hump Day everyone! This week is moving so slowly here. Maybe it's because of all the rain we are getting. I feel like I am in a fog. I am leaving Valentine's Day cards for today and going with a good, strong, cuppa Joe card! I love coffee. I drink it all day! And I am always on the lookout for new fun coffee related stamps, papers, washi, etc. On my last trip to NY I found this cool coffee stamp from Hero Arts called "Cup of Coffee" and knew immediately that I would use a stencil(s) in the open areas of the cup to give it some color. 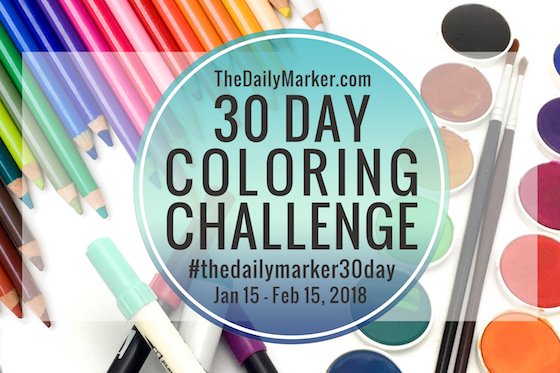 Perfect to use for Day 3 of The Daily Marker 30 Day Coloring Challenge! I started the card as I start most of my cards lately. With a piece of white cardstock and the large stitched rectangle die from the Bundle of Stitched Shapes (Simon Says Stamp). For my card front, I printed out a sheet of coffee textured paper from a free digital paper pack I found HERE. 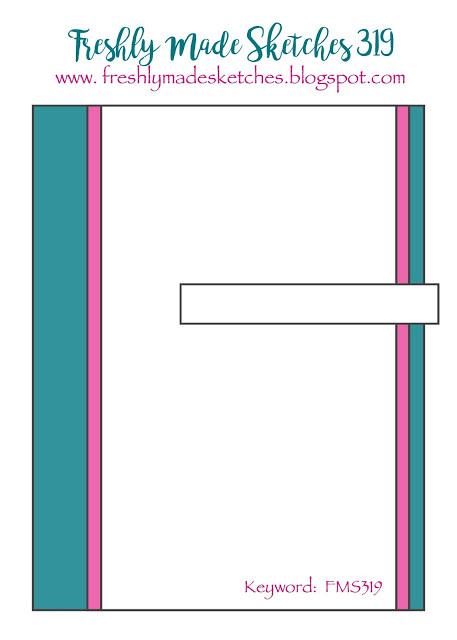 Also, on a piece of this scrap digital paper, I stamped the cup holder part of the coffee cup for later use. After looking through my stash of stencils, I decided to use the Rounded Square stencil by Sweet Stamps. After figuring out what part of the stencil I wanted to use, I secured it with painter's tape and, using a Copic Multiliner pen I traced the design making sure I did not trace off the cup. I then colored in the traced stencil area with a few fine tip Sharpie markers. Then I adhered it to the card front and I cut out the coffee cup sleeve that I stamped earlier and adhered it to the coffee cup. 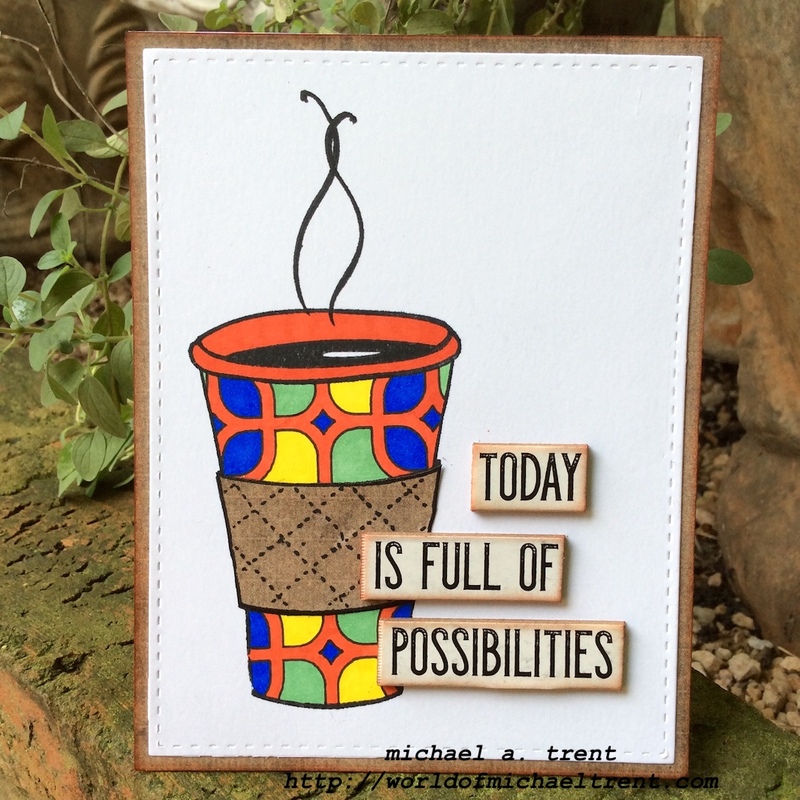 Needing a phrase, I pulled out a package of Tim Holtz Quote Chips (love these) and found the quote "Today Is Full Of Possibilities". I cut the words apart, distressed the edges, and adhered these to the card front. Hello everyone. 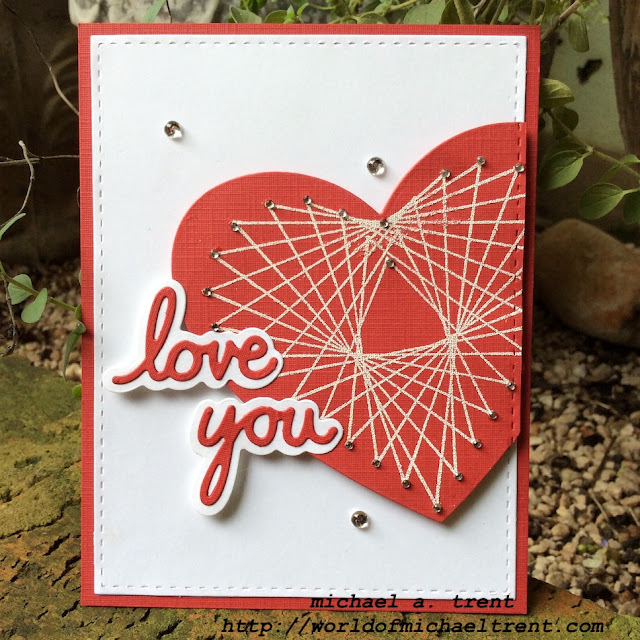 Yesterday's card showed a fun way to use the Large Faux String Art Heart from Anthony's Paper Craft. Yesterday's card had several pieces that we die cut that we didn't use. As promised, today's card shows how to use those excess pieces for a different card. Like getting two for the price of one! For today's card, I started with a card base of textured red cardstock. Then, using the large stitched rectangle die from the Bundle of Stitched Shapes (Simon Says Stamp), I cut a piece of white cardstock, which I adhered to the red cardstock. 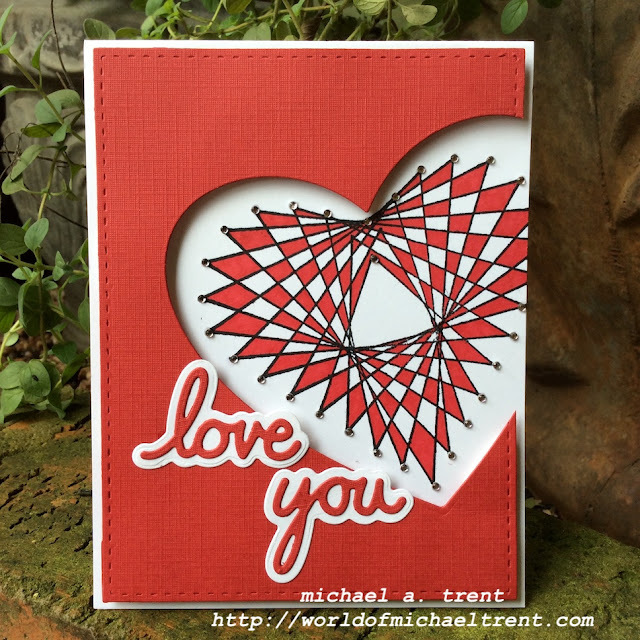 Next, I took the negative heart cut-out piece that was left over from yesterday's card and I stamped the Large Faux String Art Heart with Versamark ink and then embossed it with some Fine Detail White Embossing Powder from Sweet Stamps. Next, I put some foam dots behind the heart and adhered it to the card front, making sure to line up the stitching so it matched the stitching on the white cardstock. I also adhered the "love" and "you" using pop dots on the left side and glue on the right side. Today starts a new 30 Day Coloring Challenge over on The Daily Marker. I love these coloring challenges and I had very little time to participate in the last one and I am hoping to color something for each of these 30 days! Today's card is a different kind of Valentine's Day/Love You card that has minimal coloring but I think this card really pops! When I got my box of stamps from Anthony's Paper Craft for design team projects, I received several "string art" stamps. I looked at the instructions on how to use these stamps but I wanted to use them for cards but in other ways and NOT use string. I think I achieved this with today's card where I use the Large Faux String Art Heart stamp. I started with an A2 card base of white cardstock. Then I cut a piece of textured red cardstock using the large stitched rectangle die from the Bundle of Stitched Shapes by Simon Says Stamp. Using the 2nd largest die from the Nesting Hearts set by Lifestyle Crafts, I placed the die on the right side so it would cut off the cardstock. For the next step, I used my Misti so I would get perfect placement of the stamp. I placed both layers of the card in the Misti and then I placed the heart stamp in the heart cut-out. Once I had it perfectly placed, I closed the lid so the stamp would stick to it, removed the red cardstock, and then I stamped the image. The Misti makes this so easy! Then I colored in the heart in a checkerboard pattern with a red fine tip Sharpie marker and I adhered a small crystal on the tips of each point. I also die cut the Say It 2 - Love You die set (Technique Tuesday) using red and white cardstock. I cut the dies twice with both the red and white cardstocks. I use the reverse colors in the card tomorrow...so come back! Final steps were to put some foam tape behind the red cardstock and adhere it to the card front. I also adhered the words "love" and "you" to the solid white pieces and adhered them to the card front. Done! Here is a close-up of the heart with the crystals. Hello everyone and Happy Sunday! Is everyone having a great weekend so far? I hope so! I have been busy with several projects at the same time and cannot find anything on my desk - but somehow the chaos on my desk helps the creativity flow better. Can anyone relate? Today's card was not a planned project but last night, in the midst of the creative chaos, I got an email from Freshly Made Sketches and the sketch immediately caught my eye. As I pondered how I could make out a simple card, quickly, I looked over and saw a cool stencil I had on my desk sitting with my favorite sentiment set ever and this card idea popped into my head. I started with an A2 top-folding card base of white cardstock to which I adhered a piece of textured red cardstock, 3.5"x 5.5". Next, I cut the smallest long die from the A2 Matting Basics B set (Spellbinders) out of white cardstock and stamped the sentiment "You're So Thoughtful" from one of my favorite sentiment sets called Greetings Set 2 by Anthony's Paper Craft. Then I cut and embossed a piece of the textured red cardstock with the long die from the A2 Matting Basics A set (Spellbinders). I adhered the white cardstock to the red cardstock and set it aside to use later. Next I placed the white cardstock on a piece of scratch paper and adhered the stencil (Litocart/Brasilian Brand) over the white cardstock with painter's tape. Using some distress inks (candied apple, mustard seed, and spiced marmalade by Ranger) I applied the ink over the stencil, varying the colors. Lastly, I adhered a piece of white fun foam to the back and then adhered this to the card front. Then I adhered the phrase. I think this sketch is perfect for a quick and easy card. And by using 1 stencil, a couple of inks and a sentiment...it can't get any easier. You can even use a piece of designer paper in place of the stencil. Before I get to the card for today, I wanted to share his New Year card that was supposed to be posted on December 31st. But life got in the way. 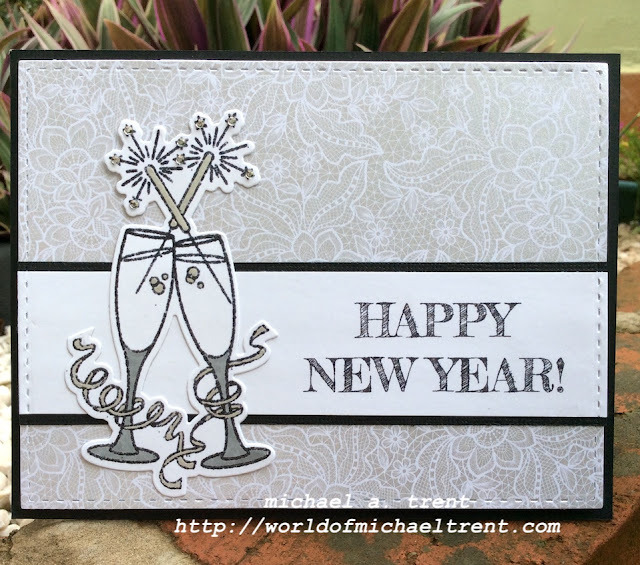 I used a beautiful metallic lace paper from a Brazilian company, the phrase was created on the computer, and the champagne glasses called Clink is from Your Next Stamp. I made today's card for a new challenge blog called "If You Give A Crafter A Cookie". My friend Debra is now on their design team and I thought I would help her out with her first design team post, which you can see HERE. 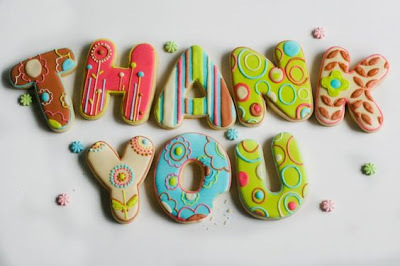 The blog name alone cracks me up and when I saw the "inspiration photo" of colorful cookies and the "Thank You" theme I came up with an idea for a card using some more stamps from Anthony's Paper Craft. When I think of cookies I immediately think of chocolate chip cookies (my fav after Oreos) so I started by cutting a piece of light brown cardstock (to give that cookie feel) with a stitched rectangle die. Then I stamped Butterflies 1 with my Misti and colored them with colored pencils - something I have not used in a long time. I was trying to make the butterflies colorful like the cookies. Next, I cut a piece of light brown fun foam, adhered it to the back of the butterflies, which I then adhered to the front of an A2 card front of red cardstock. 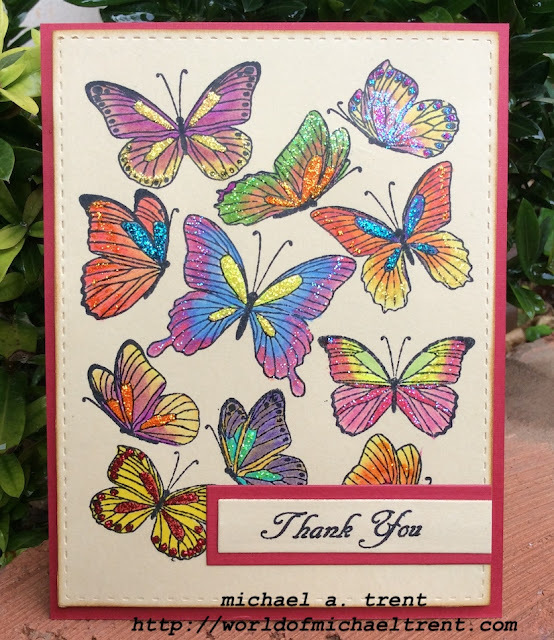 I also stamped the phrase "Thank You" from the Greetings Set 2 on the same light brown cardstock, which I layered on a piece of the same red cardstock. 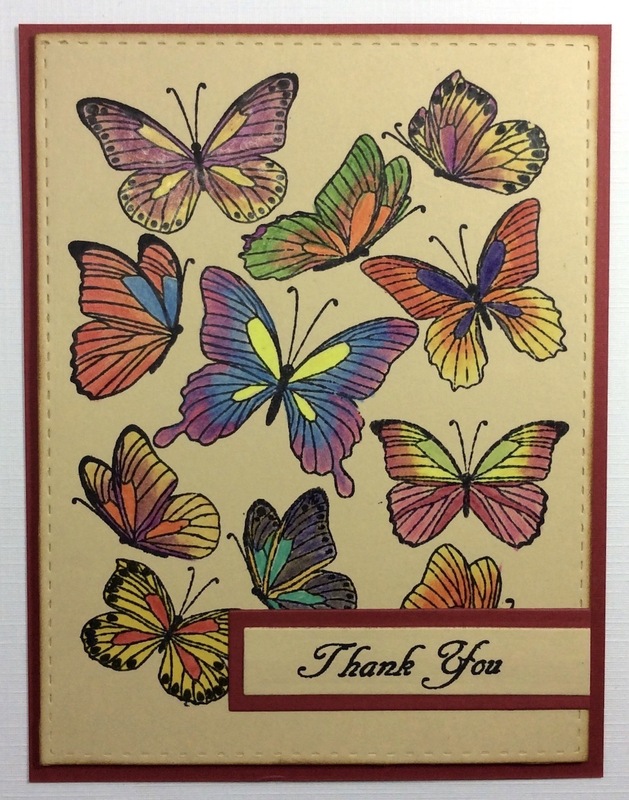 Lastly, I applied various Stickles to the butterflies to give this some shimmer!